The folks over at Schlafly’s have come up with a different strategy to handle the surge in popularity that craft beer is enjoying; Have someone else brew the beer. In 2009, Schlafly’s brewed about 30,000 barrels of beer, and this year rising demand has pushed output up to 42,000 barrels. The brewing capabilities at their Maplewood, Missouri Bottleworks and St. Louis Tap Room are maxed out, and they’re not ready to invest in expanding just now. They say it’s because they don’t want to overextend themselves financially, but I think that’s only one piece of the puzzle. They are currently looking for investors for the brewery, and taking on a load of debt would probably make them less attractive to potential suitors. So instead of doling out for an expansion, they are turning to Backpocket Brewery in Coralville, Iowa and the Blackstone Brewery in Nashville, Tennessee to brew their stuff for them. But unlike typical contract brewing arrangements (here’s my recipe, brew my beer) Schlafly’s is has a couple of aces in the hole. Schlafly alumni. Jacob Simmons used to be part of Schlafly’s quality control lab and now works at Backpocket Brewery in Iowa, and Dave Miller at Blackstone Brewery in Nashville used to be the head brewer at Schlafly’s St. Louis Tap Room. Both men are uniquely qualified to brew to the Schlafly standard, even if they aren’t in the Show Me State (EDIT: Had this as the “Keystone State” until a smart reader pointed it out – I’m a moron!). In addition, Schlafly’s has taken care to make sure everything else is up to spec, right down to the composition of the water. The reason I’m writing about this is because Schlafly’s is one of my favorite brands of beer – everything I’ve had from them has always been at least very good and at times very special. I hope that this goes off without a hitch and they don’t mess with the quality that I’ve begun to take for granted. In the end, the test is in the taste. If the beer is good, then it’s all good. And if you’re in St. Louis, don’t worry – you’ll only get the homegrown stuff. Jim, didn’t your Mom ever tell you not to pick on your older brother? We love Schlafly here in St. Louis too but we’re in the Show Me state rather than the Keystone state. I guess they should call New Jersey the Moron State (lots of evidence to support this on Bravo and MTV). I’ll fix it now – thanks for the heads up!!! As long as the quality doesn’t suffer I think this is a great way to expand without a lot of additional capital expenses. It can really help the contract brewery too. Fort Collins Brewing recently did a major expansion and since they don’t need the full capacity right now they’re working with smaller breweries like New Planet to do contract brewing. Two things come to mind when I saw this story. First, it seems to be a really great strategy for gypsy brewers to contract out facilities. 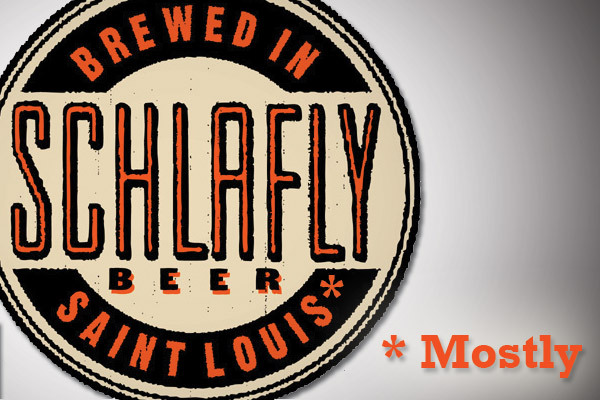 So, why not a brewery like Schlafly? Also, another brewery in the StL area (O’Fallon) used a brewery in Wisconsin when their demand outgrew their capacity. Despite some setbacks for that brewery, it seems to have worked somewhat. I can assure you our choices have nothing to do with the succession planning of our owners, nor is it entirely about overextending ourselves financially (although that is a prime reason). Because our breweries were built in the middle of a city, we literally have no room to expand on our existing facilities (unlike a brewery like New Belgium that is essentially in the middle of a giant field and can just keep adding). So what that means, is that if we were to build a brand new facility in St.Louis, it would have to be really big (like 20-25$ million big) to future proof us for growth and it would also immediately make our Bottleworks redundant. We would also essentially have to commit to creating something, that would take roughly 5 years to design, build and get up and running, that would cost us about twice what our entire company is worth (including the fact that about half our sales still come from our two restaurants), and it’s size would have to be entirely based on very loose guesswork as to what our capacity needs might be 5-10 years from now. That’s a pretty ridiculous and frightening prospect for a company our size. Add to all of that…the overall economy is in the dumps. We really don’t know what our growth is going to look like going forward, and we don’t want to make any decisions that suddenly put us in a position where what we brew is dictated by a massive bank note. Even more importantly, our owners don’t want to make any decisions that were they to go south, would put Schlafly jobs at risk. Obviously we want people to drink Schlafly Beer, but we’re not out to take over the world, nothing is more important to us than making sure our employees feel secure in their jobs. What we’re doing really isn’t contract brewing. We don’t own these breweries, but to an extent, they are built similar to our specs, with our own expertise and we’re using our own people to oversee the brews. We are very much considering the capacity we’ll get from Nashville and Iowa as coming from satellite Schlafly breweries. This is pretty great for us because it allows us some time and wiggle room by accessing an extra 10k+ barrels with low risk and it allows us to help our friends get up and running as well. As you can imagine, getting a huge bank loan these days to open a new brewery isn’t easy, and being able to tell your bank you already have a guarantee of capacity from a large brewery like us really helps. And…if and when we bottle at either place (as for now, it will just be kegs of one, maybe two styles), I guarantee you won’t see a “Brewed In Saint Louis” logo on those bottles (I’m personally hoping to see “Brewed In Nashville” and “Brewed in Coralville”) . We intend to be completely transparent with what we’re doing and are completely committed to making sure the quality is as spot on as its always been. Thanks for the great write up, support and the kind words. 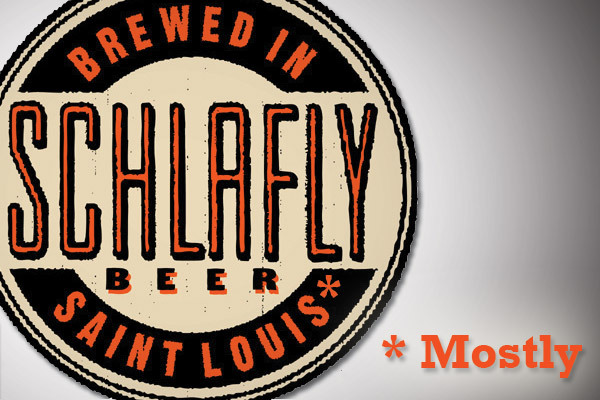 As someone who grew up outside of STL under the banner of AB and currently lives in Nashville I’m excited to know Schlafly will be brewed in my back yard. Blackstone brews some great beer as it is (it’s great to see them back on the shelves) and is worth a visit for their chipotle pork and grits and fish and chips (amongst other great food on their menu). It’s an exciting time to be a beer drinker in Nashville and it’s great to know already good / great beer will be brewed here.